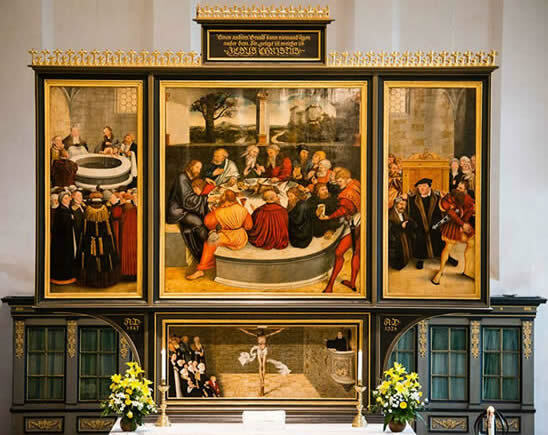 The Freemanart Consultancy are expert in conducting complex attribution and authentication investigations and in effecting international archival research into European Altarpiece & early Biblical Panel paintings. 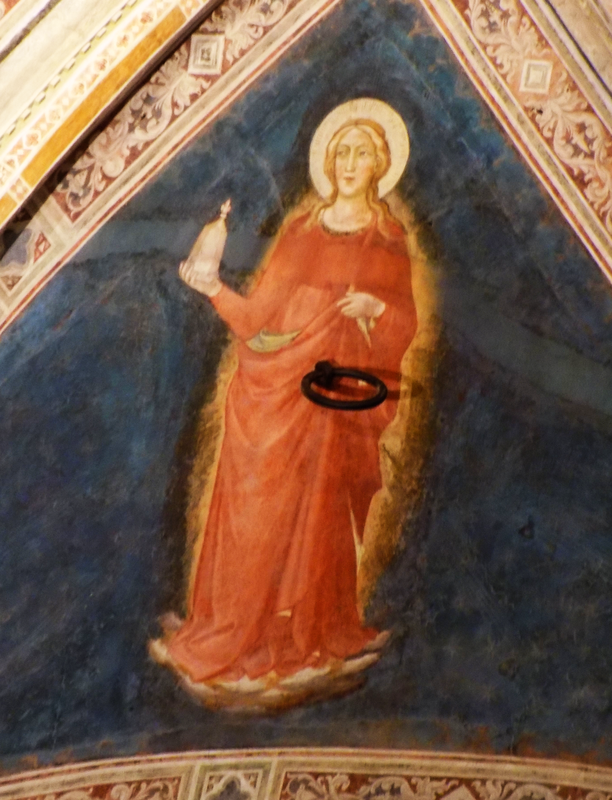 We undertake wide ranging investigations, conducting both academic in-depth studies, alongside provenance research and utilise a variety of forensic applications in the specialised field of altarpiece art. Establishing internationally accepted artist and workshop attributions. Triptych; Paintings made up of three sections, often hinged together and attached to either side of a central panel. 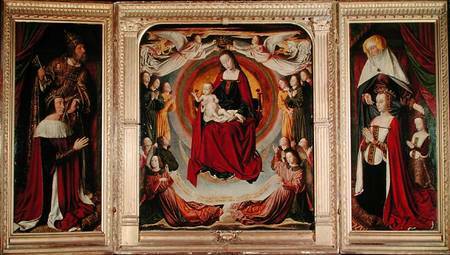 These range from small works for domestic devotion, to major altarpieces. Diptychs,; Two hinged wooden panels which can be closed like a book and the more complex and elaborate Polyptych. multi-panelled, dynamic altarpieces and screens. Usually depicting the holy family or individual saints set against a celestial gold background within an intricate Gothic architectural frameworks. In the main these are painted by the most important workshops & artists. Many such works of art have in time become separated and are thought to be single paintings which appear in collections. We investigate many leading to positive attributions. 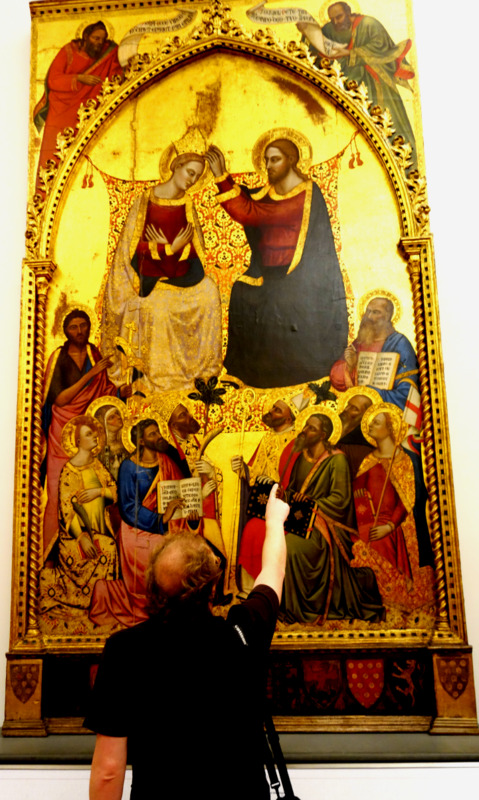 Freemanart's Mathew Freeman examines the “Coronation of the Virgin” by Jacopo di Cione at the Galleria dell’Accademia in Florence, Italy. 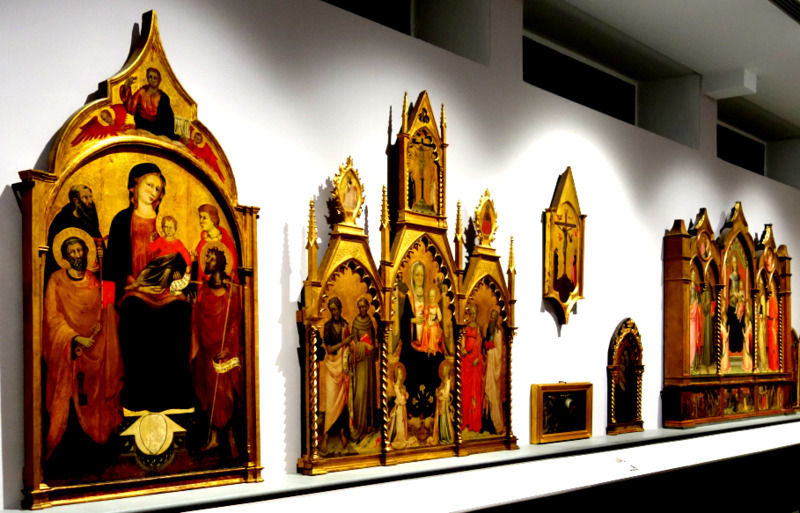 We also have scholars with specific expertise and wide ranging knowledge of Italian altarpiece paintings, including the Sienese, Florentine and Roman schools, but also in French, Flemish and German religious iconography and altar pice art. 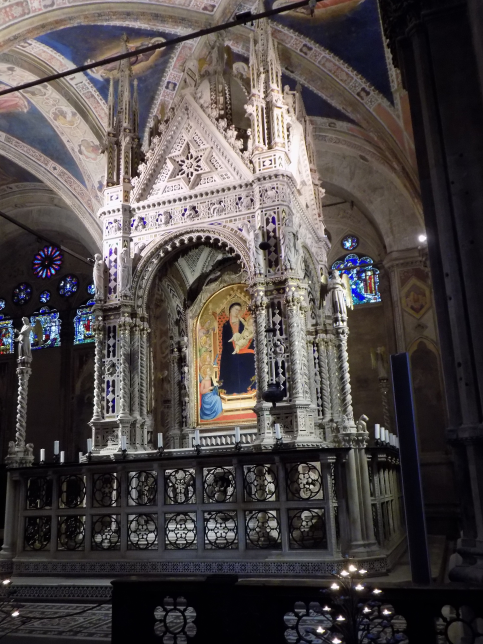 Most altarpieces date from about the year 1000 onwards, when a religious shrine was relocated to a more formal place and where the altar was to become the focal point of the church. Altar panel-paintings became common in Europe from about the 15th century and were created by artists and their studio workers using either oil paint or egg tempera. This was applied to wooden panels set in decorative and often highly elaborate, architectural gilded frames which formed part of the churches cherished decoration. 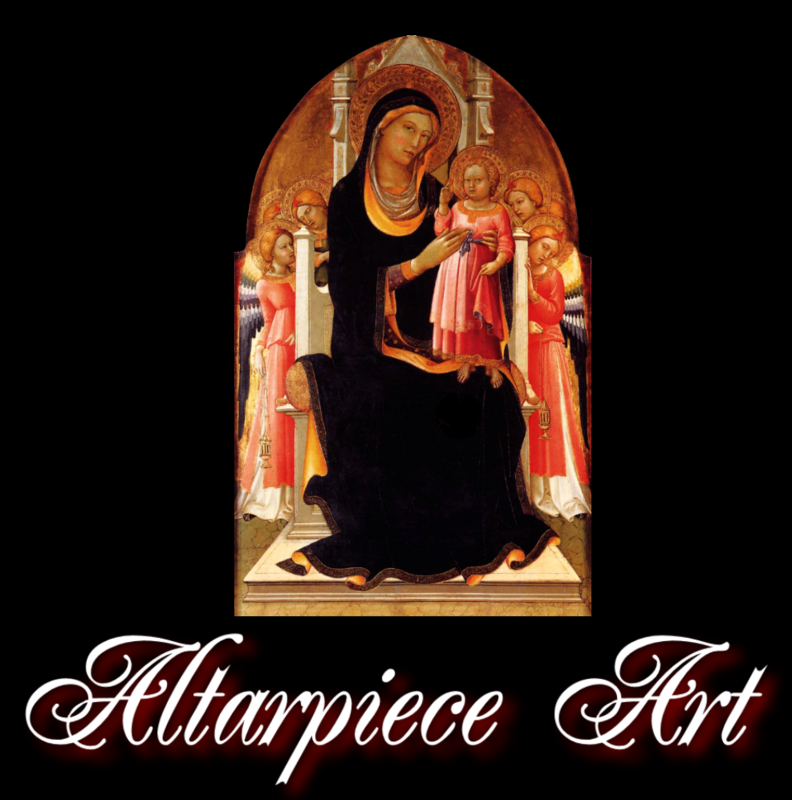 Altarpiece iconography and its subject matter is formally linked to Biblical art, specifically featuring the Holy Family and respective Saints. 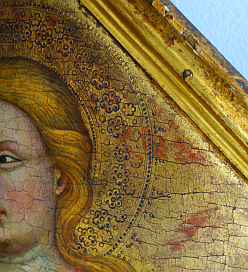 It also contained large areas of expensive gilding to both the frame and the picture itself. The amount of gold leaf was determined by the patron of the work, who set both the price for the undertaking, its size, manner and the subject matter, according to their status, the positioning and reason for its undertaking, linked to the depth of his pocket. The demands placed upon artists by their patrons who commissioned the work was such, that a recognised image consistency of the characters depicted in the panel painting was demanded. As such the artist needed to refer backwards to other artist's representations as examples. Such as saints and other figures for their own likenesses. 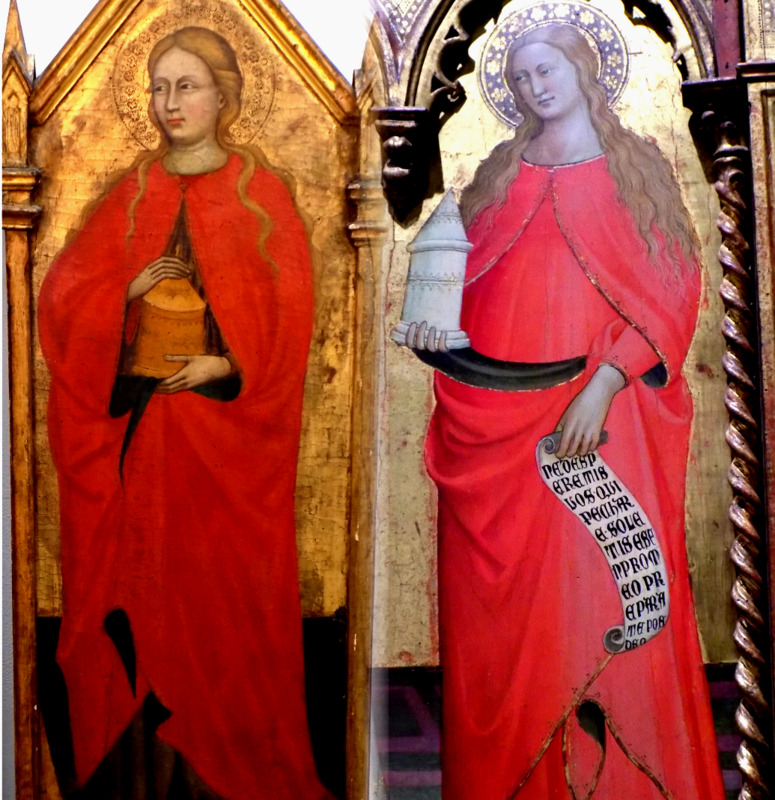 A good example is the likeness of Mary Magdalene [to the right] when placed side by side with another example of the same saint, painted by Lippo d'Andrea di Lippo. 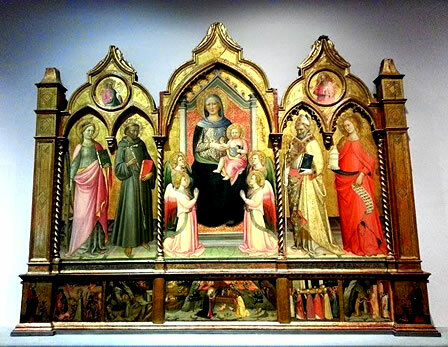 In the first - the left side image, painted in about 1360 and from the di Cione studio and workshop, is the right hand panel of a unified altarpiece, now a Triptych and one which we were investigating in Florence, for a private Swiss collector. 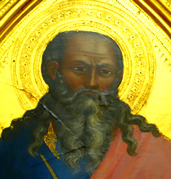 for the Chiesa di Santa Maria degli Angiolini. 'Enthroned Madonna and Child with Saints Catherine of Alexandria, Francis, Zanobius and Mary Magdalene. He took his likeness from somewhere? Here in this complex 'predella' above, the scale, reality and relationship of the composition is not paramount. The story and how it links however is. In the creation of altarpiece art, masters were assisted by pupils and other members of the workshop in their difficult and complex preparation. Each had specific technical abilities and skills. Modern technical analysis and x-radiography have deepened our understanding of this process, allowing for a closer examination of the materials and techniques used by the artist and his studio which helps us in the attribution process. In the gilding itself there are also clues to the artists who created them. There is a consistency of the metal stamps used by different studios and the punch marks themselves are often formidable comparative indicators in considering and artist attribution. The Freemanart Consultancy specialise in art authentication investigations and artist attribution research and have experts who specialise in the study of Northern European altarpiece, panel paintings and biblical art. We are specifically here to assist you with the pursuit of the truth in art attribution, authentication and provenance issues and due diligence enquiries. * Before entering into a full investigation of the legitimacy of a work of art, be it academic, forensic or as with most cases, both, it is essential to know if the project is viable and in the long term can likely be proven. Much as you would need to know if you were taking a legal case to court. Logically, if it is not, you should not attempt it, as the risk of failure is too high. So we prefer to make a preliminary and vital professional pre authentication assessment for clients first. This is based upon the images you supply, the details and the items provenance and history.